Without Chetou, we would have soon been lost amongst the date palms. He had navigated the network of dusty tracks and dry riverbeds that crisscross Skoura palmery with ease, leading us in deeper and deeper until we were surrounded on all sides by a wall of green: fig, walnut, olive, almond and pomegranate trees, and those towering dates, their fronds sheltering us from the sun and shutting out all sound bar birdsong and the tinkling of the mad-made streams that bring life to the grove. Chetou seemed to know where every twist and turn would lead. He was also surprisingly strong for his size and had carried our children, Maisie and Joe, all the way from our kasbah, without so much as a grumble. His reward is an apple from our guide, Kamal, and several loving pats on the neck from Maisie, who had fallen for this adorable little donkey as soon as she’d set eyes on him. 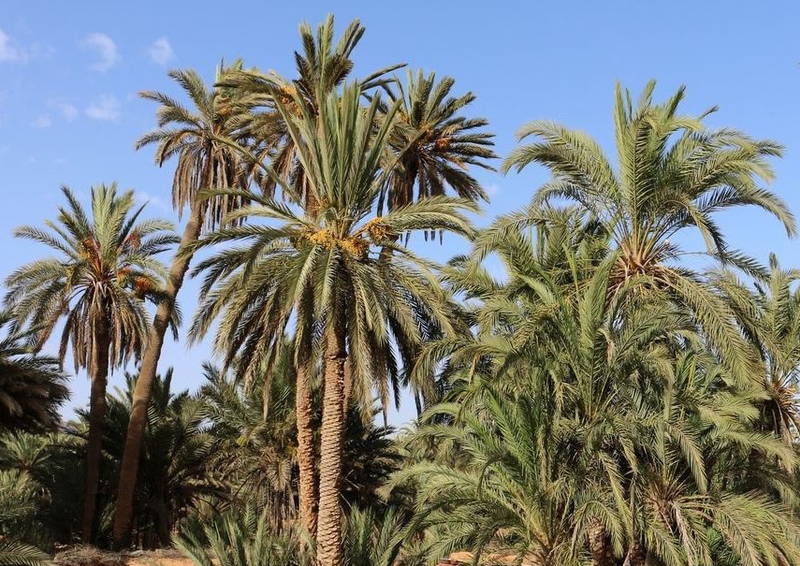 Legend has it that Skoura’s palm groves were laid out by an Almohad sultan nine hundred years ago, and as we walk around the oasis, Kamal shows us the ways in which life here seems to have barely changed in the centuries since. In the shade of the fruit trees, families who still live in the palmery grow onions, barley, beans and alfalfa, their plots all watered in turn by an ingenious system of underground channels (khettaras) and streams (seguias). We had been struggling to explain to Maisie how the palmery could be so verdant when everything around it was so dry and barren; here, trickling along in miniature earthen canals beside us and cooling the ground beneath our feet, was the answer. As we move through the palmery, Chetou plodding carefully along whilst his besotted passengers cling to the Berber rug that doubles as a saddle, ancient kasbahs come and go between the trees. There are hundreds here, all built from compressed mud and straw, some now crumbling into the ground from where they came. They’re remnants of Skoura’s time as a way-station on the caravan route that stretched out into the Sahara, when traders selling gold and slaves would rest and replenish themselves at oases like this along the way. These, like the famous Kasbah Amridil on the palmery’s southern edge, still have the stout towers that once guarded their communities against attack, their walls inscribed with geometric Berber patterns and topped with decorative arches. To the kids, they look like scaled-down castles made of earth. Chetou waits whilst they rampage around a particularly well-preserved one, pretending they’re war-mongering tribesmen looking for a weakness in its defences. Then they hop onto the saddle again and he navigates his way back through the walls of green, across the tracks and riverbeds, and home. Skoura is 240km east of Marrakesh. Les Jardins de Skoura, a lovely little kasbah on the palmery’s southern edge, organizes guided donkey rides.